It's been a busy week with the kids here. School is winding down which means school-parties are winding up. The weather has been absolutely gorgeous too, so we've been outside more than inside. Less sewing but I've loved every minute with my kids. Sometimes, after more complex projects, I like to do something simple. 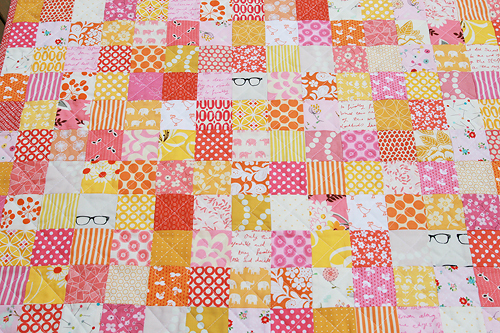 And I never tire of simple patchwork squares. 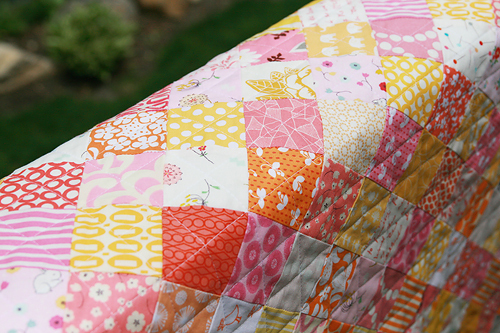 I started this baby quilt after my Arkansas Traveler quilt. I had so much fun pulling pinks, oranges, yellows and whites from my stash. (Those glasses, love!) I'm not sure exactly how many different fabrics are here, but I believe it's close to 40. The squares were cut to 2-1/2" x 2-1/2". There are 288 squares - wow! I always underestimate how long it will take to sew that many squares together. The backing is my absolute favorite print of Aneela Hoey's Posy line. I bought yardage, that's how much I love it. I quilted this baby quilt in a diagonal crosshatch.